Cross Walk California got off to a wintry start in the mountain town of Tehachapi on Tuesday, January 22. The very moment I parked the van and stepped out, snow began to fall. And for the next six hours of cross-walking and praying for this city of 13,000 inhabitants, the warmth of the Son filled my heart as I hoisted the 60-pound, ten-foot cross upright at various downtown and residential locations and prayed for great revival to break out in this mountain community. The response of the people at the sight of a street evangelist carrying a large cross throughout both commercial and residential streets as snow fell was, to say the least, very upbeat and positive. At City Hall I prayed for the mayor, council members and all city employees, that they give their lives to Jesus and allow Him to lead them in all governing decisions for the safety and welfare of the people of Tehachapi. At the headquarters of the city’s newly incorporated police department I hoisted the large cross upright and prayed for the safety of these law enforcement officers as they carry out their sworn duties to protect and serve and for crime to decrease throughout all of Tehachapi. No policemen in sight as I prayed. Here are some pictures from the Tehachapi walk. And yes, it did snow while I was walking! Great day to walk for Jesus. 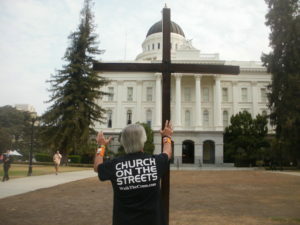 In August, 2006 several brothers and sisters from Christ Cathedral went out to walk the cross with Street Evangelist Tom Alexander around greater Bakersfield. One of them took some pictures and then made this great slide show which was played at their church. The music is “The Wonderful Cross” by Michael W. Smith. Many thanks to the men and women at Christ Cathedral for their continued support and prayers.